Japan’s export of aluminium rolled products is increasing year-on-year. Barring a dip in 2016, the average annual increase (in volume) has been around 14 per cent. 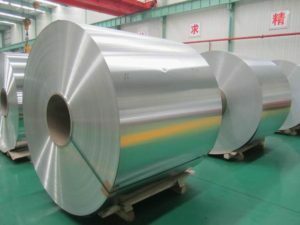 The main category of aluminium rolled products i.e. aluminium plates, aluminium strips, and aluminium sheets which find a wide application in the foil packaging and automotive sheet markets has been witnessing this surge in shipment. According to global trade data, Japan exported 251,452 tonnes of aluminium plates, aluminium sheets and aluminium strips in 2016, down from 255,660 tonnes in 2015. The value of export has also risen from US$975 million in 2014 to US$1.05 billion in 2016. It is estimated that aluminium plates, sheets and strips export by Japan will reach 286,842 tonnes in 2017. The value of export will stand at US$1.14 billion. Japan is home to two of the world’s leading automotive rolled aluminiumproducers- UACJ Corporation and Kobe Steel and Aluminium. Globally automotivealuminium rolled product market is growing driving the demand for aluminium plates, sheets and strips. UACJ Corporation reported a total aluminium rolled sheet sales volume of 1.02 million tonnes in fiscal 2016, up 51,000 tonnes YoY. By region, the volume is balanced between Japan and overseas. The sales volume of automotive aluminium sheet in FY2016 increased to 104,000 tonnes from 80,000 tonnes in FY2015, contributing about 10 per cent of the total rolled product sales. The company expects automotive aluminium sheet sales to increase to 135,000 tonnes in FY 2017. Kobe Steel is also expanding its market in the US. It ships considerable volume ofaluminium plates, sheets and strips globally which finds use in automotive BiW and closure applications. The company signed a deal with Toyota in 2016 as per which it will produce and supply aluminium sheet for the hood and liftgate for Toyota’s 2016 Lexus RX 350 crossover in the U.S.
For more information on the rising consumption of aluminium rolled products in automotive industry read AlCircle Special Focus: Growing Consumption ofAluminium Rolled Products in Automotive Industry 2017.